Discover the natural pools of La Maceta, in La Frontera, El Hierro. 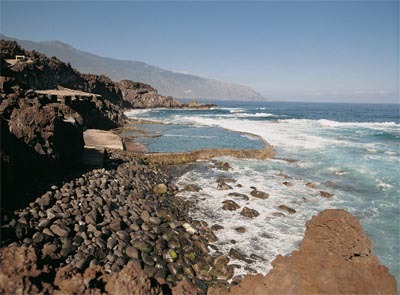 La Maceta are natural pools located in La Frontera town in El Hierro, in the Canary Islands. More specifically, La Maceta are three natural pools located on the Valle del Golfo coast, which have been perfectly prepared for bathing. At this natural pools you might enjoy a family day with lots of fun. Nearby you’ll also find a picnic area with grills. If you forgot to bring your own food, or you simply don’t want even to think about it, you’ll find many restaurants nearby known for their fresh fish dishes made with local recipes. To get to La Maceta we reccomment you to rent a car in El Hierro and drive till La Frontera on the north of El Hierro. La Maceta, La Fronterta, El Hierro.